Microsoft opened its E3 2018 conference with one of its more predictable announcements – there is a new Halo game, it’s called Halo Infinite, and it’s coming to PC via Windows 10. That’s the first time a Halo game has launched on PC at the same time as console. Rather than tell us anything more, the announcement trailer showed us instead, presenting some gorgeous landscapes created in the Slipspace engine. 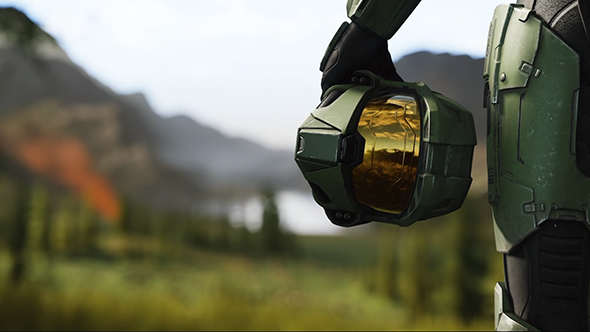 That’s an all-new engine by developer 343 Industries, and will power Halo Infinite. Might the PC’s first-ever Halo launch game make our list of the best shooters on PC? That makes sense, as we know Microsoft is preparing to wade into the VR market with its own range of headsets and they will need a big launch title. Better yet,Steam support is confirmedfor them. We’ve been scrambling to gather together all the key details about Master Chief’s latest adventure, so check out everything we know about Halo Infinite to see if there’s anything you can learn. The Halo games follow a super-soldier referred to as Master Chief, who went rogue in the last instalment to seek out Cortana, his former AI companion. Halo 5: Guardians saw the player switch between Master Chief and Spartan Locke, a more recent and more loyal super-soldier who has been dispatched to bring Master Chief in.